The Civil War and the meaning of life. On a hot Saturday in September 1962, I crowded with my brothers and cousins into my aunt and uncle’s station wagon and drove off to war. Passing through our county in Virginia’s Shenandoah Valley, we headed toward Charles Town, West Virginia, then crossed over the confluence of the Shenandoah and Potomac rivers at Harpers Ferry into Maryland. We had traveled through the familiar historic landscape of Stonewall Jackson’s skirmishes, Mosby’s raids, Sheridan’s ride, and John Brown’s capture and hanging to witness the centennial re-enactment of the Battle of Antietam. Our route was not very different from the one Jackson and A.P. Hill and their troops had followed to arrive from Harpers Ferry for their critical roles in the battle. But we had a better idea of what to expect. The preceding summer, in July 1961, some thirty-five thousand spectators had thrilled to what the press had dubbed the Third Battle of Bull Run. Several thousand men clad in blue and gray had assembled on the field where two major encounters of the war had been fought to perform, as a New York Times reporter described it, a “dramatic résumé of the battle’s highlights.” Perched in bleachers and grandstands, or milling in an adjacent field of refreshment tents and folding chairs, an enthusiastic crowd had cheered victorious Confederates and booed fleeing Union troops, just as Virginians had hailed their predecessors a century before. The Battle of Antietam, fought on September 17, 1862, was of even greater significance in the war than either the first or the second Battle of Bull Run. It remains the bloodiest single day of conflict in American history, a day when more than 3,600 Americans died. The battle transformed and defined the purposes of the war, for the Union’s success propelled Lincoln into issuing his preliminary Emancipation Proclamation. But neither our minds nor those of the thousands of observers and re-enactors around us were focused on such matters. We were there for a picnic and for an exciting display of lifelike military action, a spectacle that would remind us of the courage and the sacrifice we had been taught to revere since the time we were very small and played Civil War with toy swords and rifles in the fields and woods that surrounded our house. The Civil War centennial occurred in the midst of challenges and changes nearly as dramatic as the war itself. Those years in the early 1960s were not just a historic anniversary but themselves a time of history-making. The nation found itself again convulsed in a struggle over the meanings of citizenship, justice, and equality. As I was attending at Antietam a rendering of the past that divorced it from history, a quite different battle was raging in Washington, just seventy miles away, over the celebration of the Emancipation Proclamation that was scheduled to take place at the Lincoln Memorial the following week. No African American had been invited to speak, and the NAACP, endorsed by Martin Luther King Jr., threatened a boycott. As enthusiastic crowds during these centennial years cheered Confederate troops at Bull Run and Antietam, hailed Jefferson Davis in a restaging of his inauguration in Montgomery, and resurrected the long abandoned Confederate Stars and Bars to fly over statehouses across the South, civil rights activists joined sit-ins, picket lines, and freedom rides and called upon the emancipationist traditions of the past to situate themselves and their cause on the right side of history. When King delivered his “I Have a Dream” speech from the steps of the Lincoln Memorial almost a year later in August 1963, he self-consciously placed himself within the Civil War centennial—not the historyless version of the re-enactors, but one that urged Americans to finish the revolution the war had begun. “Five score years ago,” he declared, “a great American, in whose symbolic shadow we stand today, signed the Emancipation Proclamation.” He was invoking two of Lincoln’s most famous utterances, both issued, as he noted, just a hundred years before. Even as his language recalled the Gettysburg Address, he was drawing explicit attention to the Emancipation Proclamation. His opening sentence thus united the two documents as foundational to the meaning of the war, and of course to King’s definition of America. The valor and the sacrifice of Gettysburg were rendered inseparable—in his words as in his understanding—from the war’s transcendent purposes of freedom. King was seizing the right to the kind of celebration of the Proclamation that Civil War centennial organizers had suppressed not quite a year before. The legacy of the Civil War was deeply contested at the time of the centennial because its meaning continued to matter. Robert Penn Warren wrote of the war as “that mystic cloud from which emerged our modernity,” as “the great single event of our history.” The historian and novelist Shelby Foote called it the “crossroads of our being.” John Hope Franklin believed that it provided a “common experience of suffering and sacrifice” without which real nationhood and pursuit of a common destiny would have remained impossible. It is, in fact, not difficult to see ourselves reflected in the war’s mirror. In ending slavery, the Civil War helped to define the meanings of freedom, citizenship, and equality. It established a newly powerful and centralized nation-state and launched it on a trajectory of economic expansion and world influence. It was an all-American war—of brother against brother, as is often said. It was fought on our own soil, in places with familiar names and by people who seem not so unlike us. It featured leading characters—Lee, Jackson, Lincoln, Grant, Sherman—who combined the estimable and the flawed in ways that continue to engage biographers, readers, and television and movie audiences. It attained a scale that shocks and horrifies—a scale of drama and a scale of death that prefigured the slaughter of the century that followed. It enacted a morality play demanding that a nation that regarded itself as the last best hope of earth confront its own deep-seated injustices. As Woodward reflected, and as the centennial observances proceeded around him, the Civil War and its meaning aroused intensifying controversy. In the late nineteenth century, sectional reconciliation had been achieved by abandoning the war’s emancipationist legacy and relegating black Americans to the second-class citizenship of segregation and Jim Crow. Memory and history focused on battle, glory, and sacrifice, with the still divisive issue of race pushed largely aside in deference to white Southern custom and sentiment. Confederates became valiant opponents rather than traitors, their cause not slavery but states’ rights, their loss not a failure but an exhaustion of resources that left them the proud, if defeated, underdogs. But the growing force of black voices in the 1960s, and the re-insertion of race into national discourse and the national agenda, challenged the prevailing narrative of the war. Putting issues of race and inequality front and center in the American present meant putting them front and center also in the American past. This shifting yet undiminished interest in the war has yielded five subsequent decades of pathbreaking scholarship and writing. Yet it has hardly reduced the salience of persisting differences in understanding. If Woodward were alive to witness the war’s sesquicentennial this spring, he would find that the conflict over its interpretation continues, once again mirroring our contemporary debates about national purposes. Representative Ron Paul recently attracted attention by declaring Lincoln and the war responsible for arrogations of central power that Tea Party originalists and libertarians are dedicated to overturn. Governor Rick Perry of Texas has hinted at secession as a possible response to growing anger at the federal government, and nearly a dozen states have threatened to “nullify” the recent federal health care law. The powers of the centralized nation-state achieved by the war are now questioned and challenged, seen as the betrayal rather than the fulfillment of the Founders’ vision. And significant segments of the American population, particularly in the South, continue to reject slavery as a fundamental cause of the war, even in the face of irrefutable evidence that what Southerners called the “peculiar institution” played a critical role in secession debates, declarations, and decisions across the South. As Robert Sutton, the National Park Service’s chief historian, has insisted that the nation’s historic sites emphasize that “slavery is the principal cause” of the war, he has encountered widespread resistance and controversy. 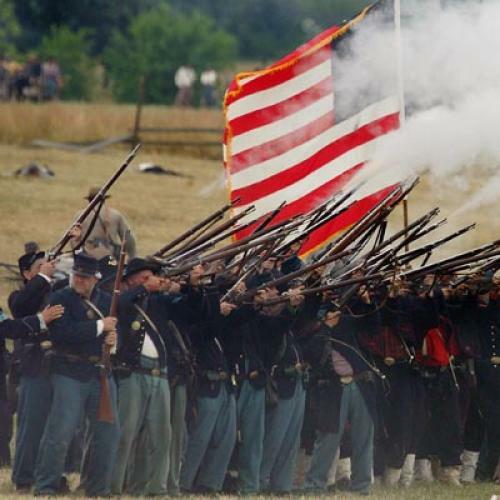 Yet even as these debates and disagreements continue, most Americans approach this Civil War anniversary with attitudes and assumptions quite different from those that prevailed fifty years ago. A nation with a black president contrasts significantly with the nation that in 1961 still denied millions of black Southerners the franchise. In September 2010, the official Virginia Sesquicentennial Commission exemplified this shift with a conference titled “Race, Slavery and the Civil War: The Tough Stuff of American History and Memory.” Issues that were suppressed or ignored a half-century ago are now necessarily fundamental to Civil War remembrance: it is no longer possible to avoid the “tough stuff,” as Governor Bob McDonnell of Virginia learned last year when he scrambled to apologize for not mentioning slavery in a proclamation of Confederate History Month. Race has moved from the margins of Civil War history to its center. Part of this expansion of historical understanding is owed to the extensive work historians have undertaken since the 1960s. We simply know a great deal more about the experience of black Americans in a variety of critical roles in the war—as soldiers, nearly 200,000 strong, fighting for Union victory; and as “contrabands” forcing the issue of freedom onto the Northern agenda; and as slave laborers refusing to continue the status quo on farms and plantations across the South. But it is not just that we have more information; we also look at the past with different eyes and ask different questions, based in the belief that rights should not be defined nor voices empowered or silenced because of race. Since 1962, American society has come to believe also that rights cannot be denied because of gender, and this, too, has shaped a new approach to our past. Like African Americans, women play a role in American society that has expanded and changed dramatically over the past half-century, and their place in Civil War history has grown in parallel. An increasing interest in the lives of ordinary Americans during the years of conflict has included a great deal of research and writing about what happened beyond the battlefield—on the homefront, in communities and in families North and South. We have learned about women left to manage plantations and farms; women in voluntary agencies; women as writers and readers; women working in factories, laundries, hospitals, and schools; slave women fleeing to Union lines or remaining to claim freedom and protect families at home. Even the battlefield looks different. In 1976, John Keegan’s The Face of Battle changed military history forever, with its powerful call for a “diversion of historical effort from the rear to the front” of the battlefield—from commanders to common soldiers. Keegan insisted on “allowing the combatants to speak for themselves.” The Civil War has proved a rich context in which to pursue such an inquiry, for the broad literacy of the American population generated at least tens of thousands—likely hundreds of thousands—of soldiers’ letters sent home from battlefields from Bull Run to Petersburg and carefully cherished and preserved by their recipients. Many of these have been collected and published; others rest in archives; others no doubt still remain in attics North and South. But they have provided the material for an intense examination of the soldier’s experience, his motivations to fight, his daily life, his politics and religion, his hopes and fears, his understandings of life and death. So we remember a very different Civil War from the one we celebrated and contested in the 1960s. The publication of an average of more than a hundred books a year during each of these past five decades has meant an accumulation of information that would inevitably change understanding. But the shifts in perception are about more than just having additional facts. Since we still believe that as a nation we have been defined by the ideals and the sacrifices of that war, we feel compelled even 150 years later to situate ourselves in relationship to it. As we come over time to see ourselves differently, we will ask different questions of our past, and as we ask those questions we will develop changed perceptions of ourselves. History is iterative and interactive, which, happily, is why there will always remain new—inexhaustible—work for historians. Uniquely powerful dimensions of the Civil War have rendered it of outsize importance to historians. For Americans, it was and is a special war with special meanings. But an essential aspect of its interest and appeal—not just to those re-enactors but to all of us—is simply that it was war. As we have sought through the centuries to define ourselves as human beings and as nations through the prisms of history and literature, no small part of that effort has drawn us to the subject of war. We might even say that the humanities began with war and from war, and have remained entwined with it ever since. The first masterwork of Western literature, dating to approximately 750 B.C.E., was Homer’s epic of the war over Troy, a tale that exerts a wrenching power more than two millennia later. Western historiography was born somewhat later, but it too emerged as a chronicle of war in the hands of Herodotus and Thucydides in the fifth century B.C.E. Some might see the connection of war with human creativity as the inevitable outcome of the prevalence of war in human experience. If one considers any century in the last five thousand years, an average of ninety-four of those years would have witnessed a large-scale conflict in some area of the world. Our histories are so full of war, we might conclude, because our history is so full of war. But if we think of our own Civil War, its four-year duration—less than 2 percent of our national history—is certainly disproportionate to the volume of both literary and historical writing that it has generated. We do not write about wars just because, like Mount Everest, they are there. For all its ubiquity and its universality, war offers the attraction of the extraordinary—the escape from the gray everyday, from the humdrum into higher things. It is indeed striking how often the language of altitude is used by those describing the allure of war: it will lift, elevate, raise us toward the transcendent, and link us to the “sublime,” a word often repeated in nineteenth-century paeans to war. In the Civil War, civilians rushed to the battlefields when the fighting ceased—many to search for wounded kin, but others to experience a direct connection to what they described as a force beyond themselves and their accustomed lives. That, in fact, was what a number of observers were seeking when they were caught up in First Bull Run and fled back to Washington. After that incident, civilians were more likely to wait to arrive until after the guns were silent. But arrive they did. These battlefield tourists earned the scorn and the resentment of the wounded, and of those struggling to provide aid amid the desolation. Yet the incongruity of their presence only underscores war’s fascination. Their notion of war as sublime was clearly rooted in the nineteenth century’s romanticism. But it nevertheless reminds us that the human attraction to war is about the struggle to surpass the boundaries of the human as well as the limits of human understanding. This paradox at the heart of the experience of war also forms the core of war’s attraction to writers and artists. War engages and thrives on contrasts—the unflinching gore and undeniable glory represented in the Iliad; the parallel human and inhuman dimensions of what the Vietnam veteran Tim O’Brien has called the “awful majesty of combat” and its “powerful implacable beauty”; the interdependence of life and death as millions have perished throughout the centuries in hopes that others—or perhaps, in Lincoln’s words, nations—might live. “War is nasty; war is fun,” O’Brien has written. “War is thrilling; war is drudgery. War makes you a man; war makes you dead.” War resists but demands understanding. It challenges us—as it has long challenged the humanities—to take it on. One of the most forceful of war’s attractions to its chroniclers is the very impossibility of their task. War’s participants have often noted the failure of words to convey either its reality or its meaning. Oliver Wendell Holmes Jr., wounded three times in the Civil War, called his experience “incommunicable.” Soldiers on both sides of the conflict would have agreed. James Suiter of the 84th Illinois reported in his diary that a depiction of Chickamauga “would be an absolute impossibility.” John O. Casler of the Stonewall Brigade struggled for words in a letter to his parents: “I have not power to describe the scene. It beggars all description.” A Wisconsin nurse, aiding the wounded in Tennessee, wrote home of the “mental and physical” suffering around her: “There are times when the meaning of words seem to fade away; so entirely does our language fail to express the reality.” In its assault on language, war challenges our very identity and essence, for it is words that help to define us as distinctively human. Yet even as they described the impossibility of their task and the ineffability of war, each of these witnesses to war set about to write, to use language where none could be found, to employ words to decry those words’ very inadequacy. The more formal literature of war reflects a similar dynamic, as writers from Homer onward have labored both in spite of and because of war’s resistance to representation. “How can I picture it all?” Homer demanded in the Iliad. “It would take a god to tell the tale.” Even to write about war, Homer observed, is to reach beyond the human, toward the sacred. More than twenty-six centuries later, contemplating America’s Civil War, Herman Melville concurred that “none can narrate that strife.” Yet both chose nonetheless to write, to find words to convey war’s meaning, seeing in its impossibility the attraction of its necessity. We write about war because it is so hard to write about war; because its contradictions demand attention, if not resolution; because its chaos demands some imposition of meaning and order. The search for understanding compels language even as it rejects it. The many collections of soldiers’ letters I have read in archives North and South reflect this struggle between the impossibility and the necessity of communicating war’s truths. Often I have found men describing themselves as beyond feeling or comprehension, numbed by their experience, yet nevertheless seeking a means to convey its significance and impact. I have come to believe that it is out of this struggle that certain recurrent images or descriptions appear—like verbal snapshots, designed in essence to short-circuit the complexity of language with an almost visual substitute—words as pictures rather than as interpretation or understanding. After a battle, we are so often told by soldiers from the lowliest recruit to General Grant himself, it would be “possible to walk across the clearing in any direction, stepping on dead bodies without a foot touching the ground.” Equally unforgettable is the way it communicates horror without ever actually naming—or grappling with—it: the image, most famously offered by Whitman but repeated and remembered by nearly every soldier who witnessed it, of a surgeon toiling with saw and knife at a field hospital, surrounded by amputated limbs, “feet, legs, arms, hands, etc.” piled in a “heap” at his side. It is not just Civil War soldiers, of course, for whom telling the story, depicting the scene, was a challenging imperative. This compulsion rests at the center of Bao Ninh’s remarkable novel of North Vietnam, published in the United States in 1991 as The Sorrow of War. Its protagonist, Kien, has survived the conflict and finds himself all but overwhelmed with the need to write about it—even against his will. “Why choose war? Why must he write of the war?” he asks. He struggles to find another subject but “relentlessly his pen disobeyed him”; he “cannot stop writing war stories.” Ultimately, however, his words and stories fail, for he can find no narrative. The manuscript that he produces is one of fragments, of images but not of coherence. Fighting on the other side of the same war, and equally compelled to write, Tim O’Brien confronts a similar sense of the difficulties of language and of narrative. His work, the now all-but-iconic The Things They Carried, is like that of Kien in The Sorrow of War: fragmented and filled with “disruptions.” Often, O’Brien writes, “you can’t even tell a true war story. Sometimes it is just beyond telling.” Yet still we try. We have been telling and hearing and reading war stories for millennia. Their endurance may lie in their impossibility; they can never be complete, for the tensions and the contradictions within them will never be eliminated or resolved. That challenge is essential to their power and their attraction. War stories matter. “War makes rattling good history,” a character observes in Thomas Hardy’s The Dynasts, “but Peace is poor reading.” Wars decide; they change rulers, governments, societies—and the human beings swept up in them. They accelerate and concentrate change in ways that make it vivid and visible. Wars are turning points, in individual lives and in national histories. Stories of war are infused with the aura of the consequential. As Ernest Hemingway once explained to F. Scott Fitzgerald, “War is the best subject of all. It groups the maximum of material and speeds up the action and brings out all sorts of stuff that normally you have to wait a lifetime to get.” Hemingway’s description of why war is the best subject is a striking, though almost certainly unwitting, invocation of the dramatic structures that Aristotle’s Poetics long ago defined—the unity of time, action, and place that, in intensifying and containing experience, refashions it as literature. Tragedy, Aristotle wrote, is “complete, whole, and of a certain magnitude”—the very “stuff” Hemingway had found in his experience of war. The inherent “magnitude” of a war story, of course, is that it is about life and death, about the quintessential moment of truth when the ultimate is at stake. Even a war story that focuses on the seemingly trivial and mundane uses the weight of war’s meaning to imbue the smallest detail with extraordinary import. When life itself cannot be taken for granted, its every aspect assumes an enhanced significance and value. But it is more than the magnitude of war, its weightiness, that makes it the best subject for our stories and that has lodged it at the heart of the humanities since Homer. War and narrative in some sense create one another. War is not random, shapeless violence. Fighting is reconceived as war because of how humans write and speak about it: it is framed as a story, with a plot that imbues its actors with both individual and shared purpose and is intended to move toward victory for one or another side. To rename violence as war is to give it a teleology. This is why it can provide the satisfaction of meaning to its participants; and this, too, is why it offers such a natural attraction to writers and historians. War assumes a trajectory toward victory and thus the possibility of its own conclusion. Like any good story, it offers the promise and gratification that accompany a resolution of the plot. When the United States invaded Iraq in 2003, it was influenced in no small part by the desire—even the need—to transform the uncertainty of combating a terrorist enemy without a face or a location into a conflict that could provide a purposeful, coherent, and understandable narrative. Responding to terrorism with war replaced the specter and fear of mass murder with a hope for the more controlled and ordered force of war. It offered the United States the sense of intention and duty, the goal-directedness, the lure of efficacy, that war promises and terrorism obliterates. Implicit in President George W. Bush’s proclamation of a war on terror, moreover, was the reassurance that terrorism could be defeated, eliminated, that it need not be a permanent condition of modern life. We expect wars to come with endings. Our war stories bear a critical responsibility for shaping these expectations from one generation to the next. Our narratives are not just modeled from war; they become models for war. They have the power to send men into battle and to shape the wars they fight. As the political philosopher Jean Bethke Elshtain puts it, “War imitates narratives imitating war.” John Keegan, who for twenty-six years served as an instructor at the British Royal Military Academy Sandhurst, has offered an example central to historical writing in his description of the “battle piece.” This highly conventionalized and invariably heroic account of combat has shaped not just the rhetoric and the assumptions of military history, but more powerfully—and more dangerously—the understanding and seduction of war itself. Tales of glory, honor, manhood, and sacrifice enhance war’s attraction and mobilize men and armies. It is war stories like these that lure the toiling clerk in “city grey” to volunteer in anticipation of the grandeur of another Agincourt—“we few, we happy few”—and then to experience instead the reality of the Somme. Fussell has written of the “tutors in this special diction” of heroism, manhood, and sacrifice in pre-World War I Britain—the poems of Tennyson, the romances of H. Rider Haggard, the boys’ books of George Alfred Henty, where the soldier is a “warrior,” the enemy is the “foe,” to die is to “perish,” and the soldiers are “the brave.” For a whole generation of men, these stories were to prove a betrayal. Modernity enshrined an irony learned, in Fussell’s view, from the horror of World War I. Or, as Philip Larkin concluded in his poem “MCMXIV”: “Never such innocence again.” We entered a new world of disillusion that would yield the dark sensibility of Joseph Heller’s Catch-22 at the heart of the late twentieth century’s approach to war. And yet: we are still lured by war and we still tell the stories that both shape and distort our understanding of it. In the 1950s, Ron Kovic learned of war from John Wayne movies and felt destined for glory by his birth on the Fourth of July. For Kovic, as for so many men through the ages, war and masculinity became inextricably intertwined: the only real man was one who had passed the test of battle. War stories still serve as instructional manuals for becoming a man. When Marine recruiters marched in perfect step into his high school auditorium, it was for Kovic “like all the movies and all the books and all the dreams of becoming a hero come true.” He returned from Vietnam paralyzed from the waist down by a severed spinal cord, bitter about a war so different from “the myth we had grown up believing,” victim of a shattered body and even more shattered illusions. He wrote his narrative of his experience to serve as an alternative war story, an ironic tale of one whose manhood was not created but destroyed by war. And yet: two months from now, we will again witness a re-enactment of the Battle of Bull Run. Tens of thousands of participants and spectators are expected. The enthusiasm to refight the Civil War has only grown in the fifty years since the centennial observances. Most of the costumed soldiers and camp followers will have read extensively about the war; they will wear garments accurate to the last button and stitch; they will use period weapons and canteens and knapsacks, for authenticity is the watchword of the thriving re-enactor culture. They will in these myriad details get history just right. But what will they understand of war? Will this re-enactment do any more to acknowledge the war’s purposes and politics—and their continuing significance to America—than did the re-enactments of fifty years ago? Will its celebratory mood and mode acknowledge what Frederick Douglass declared he would never forget: “the difference between those who fought for liberty and those who fought for slavery”? Will the re-enactors tell only an old “battle piece” of courage and glory and how sweet and proper it is to die? Will we in this historic sesquicentennial—to be observed at a time when Americans are involved in real conflicts in various places across the globe—forget what a heavy responsibility rests on those who seek to tell the stories of war? Drew Gilpin Faust is president of Harvard University and the author, most recently, of This Republic of Suffering: Death and the American Civil War (Knopf). A version of this essay was given as the 2011 Jefferson Lecture of the National Endowment for the Humanities in Washington, D.C. This article originally ran in the June 30, 2011, issue of the magazine.